Every summer, the Juniper Institute gathers a community of writers to explore the creative process and develop new approaches to the craft of writing. In association with the MFA Program for Poets & Writers at the University of Massachusetts Amherst, the Juniper Summer Writing Institute and the Juniper Institute for Young Writers both bring participants to campus for a weeklong immersion in the writer’s life. For our adult program, it is time out for writers and their work, time for wild invention, and to become a part of a community of acclaimed and emerging writers from all walks of life. For young writers, our curriculum allows participants to generate new writing, experiment with style, and access tools for finding inspiration in their day-to-day lives. Juniper gives them a unique opportunity to meet other young writers and bond over a shared love for the literary arts. 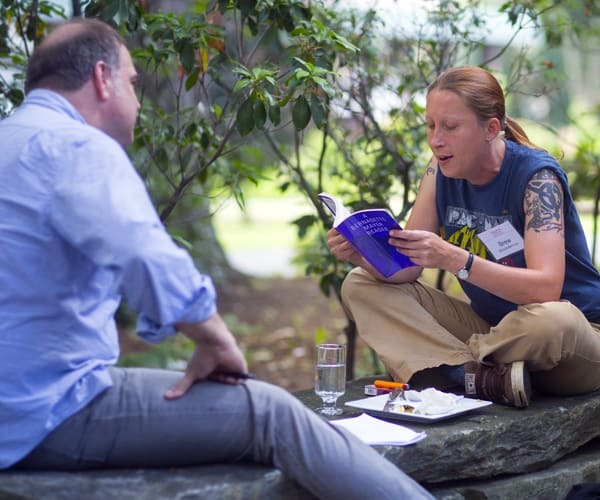 The Institute is a chance to connect with writers, poets and artists from around the country who value what prose, poetry, word, image, fiction, essay, memoir and autobiography can do. At Juniper, we understand that a kind of magic happens when you bring together a group of people who love to write; without support from its community near and far, the Institute would not be able to thrive as a hub for creativity and self-expression. Join an exclusive group of partners and organizations who provide invaluable support in the form of donations and scholarships. Your contribution will allow many talented writers to participate in the Institute who would otherwise be unable to attend, and leave a lasting impact on each participant beyond their final reading, workshop or craft session. We also welcome new sponsorship inquiries to support our Young Writer and adult programs. Please contact Jennifer Jacobson, Director, at (413) 545-8988 to discuss your support.